Generate the next channel descriptor for this buffer array. Generate the a channel descriptor which consumes the output for the channel passed in. Return the sum of all allocated bytes. Put data on a channel at the end of this buffer array. Put data on a channel at the front of this buffer array. Insert data into a buffer array after a particular segment. Count bytes in the buffer array on the specified channel. Read bytes in the buffer array on the specified channel. Find an address in a buffer array. Take the contents of another buffer array. Split a segments so that address is the last address of one segment, and the rest of the original segment becomes another segment on the same channel. Get the first segment in the buffer array. Get the one-past-the-end segment in the buffer array. Get the segment which holds the given address. 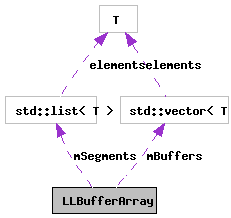 Get a segment iterator after address, and a constructed segment to represent the next linear block of memory. Make a new segment at the end of buffer array. Erase the segment if it is in the buffer array. Optimally put data in buffers, and reutrn segments. Class to represent scattered memory buffers and in-order segments of that buffered data. Definition at line 304 of file llbuffer.h. Definition at line 308 of file llbuffer.h. Definition at line 307 of file llbuffer.h. Definition at line 309 of file llbuffer.h. Definition at line 311 of file llbuffer.h. Definition at line 312 of file llbuffer.h. Definition at line 310 of file llbuffer.h. Definition at line 313 of file llbuffer.h. Definition at line 231 of file llbuffer.cpp. Definition at line 237 of file llbuffer.cpp. The data is copied from src into the buffer array. At least one new segment is created and put on the end of the array. This object will internally allocate new buffers if necessary. Returns true if the method worked. Definition at line 269 of file llbuffer.cpp. References copyIntoBuffers(), mSegments, and LLMemType::MTYPE_IO_BUFFER. Returns the segment if there is one. Definition at line 343 of file llbuffer.cpp. Definition at line 257 of file llbuffer.cpp. References end, mBuffers, and S32. This method is a helper by giving you the largest segment possible in the out-value param after the address provided. The iterator will be useful for iteration, while the segment can be used for direct access to memory after address if the return values isnot end. Passing in NULL will return beginSegment() which may be endSegment(). The segment returned will only be zero length if the return value equals end. This is really just a helper method, since all the information returned could be constructed through other methods. address An address in the middle of the sought segment. Returns an iterator which contains at least segment or endSegment() on failure. Definition at line 353 of file llbuffer.cpp. References end, mSegments, and LLMemType::MTYPE_IO_BUFFER. This is an internal function used to create buffers as necessary, and sequence the segments appropriately for the various ways to copy data from src into this. If this method fails, it may actually leak some space inside buffers, but I am not too worried about the slim possibility that we may have some 'dead' space which will be recovered when the buffer (which we will not lose) is deleted. Addressing this weakness will make the buffers almost as complex as a general memory management system. segments Out-value for the segments created. Definition at line 801 of file llbuffer.cpp. References LLBuffer::createSegment(), LLSegment::data(), end, llmin(), mBuffers, LLMemType::MTYPE_IO_BUFFER, S32, and LLSegment::size(). Referenced by append(), insertAfter(), and prepend(). channel The channel to count. start The start address in the array for counting. You can specify NULL to start at the beginning. Definition at line 469 of file llbuffer.cpp. References count, end, getSegment(), mSegments, and S32. Referenced by LLURLRequest::configure(), and LLURLRequest::upCallback(). Returns the iterator for an invalid segment location. Definition at line 348 of file llbuffer.cpp. Referenced by LLBufferStreamBuf::overflow(), LLBufferStreamBuf::sync(), and LLBufferStreamBuf::underflow(). iter An iterator referring to the segment to erase. Definition at line 773 of file llbuffer.cpp. References end, mBuffers, mSegments, LLMemType::MTYPE_IO_BUFFER, and void. Referenced by LLBufferStreamBuf::sync(), and LLBufferStreamBuf::underflow(). As opposed to some methods, passing a NULL will result in returning the end segment. Returns the iterator for the segment or endSegment() on failure. Definition at line 403 of file llbuffer.cpp. Definition at line 422 of file llbuffer.cpp. Referenced by countAfter(), readAfter(), seek(), and splitAfter(). The data is copied from src into the buffer array. At least one new segment is created and put in the array. This object will internally allocate new buffers if necessary. Definition at line 293 of file llbuffer.cpp. Definition at line 244 of file llbuffer.cpp. Referenced by LLURLRequest::process_impl(), and LLHTTPResponder::process_impl(). This method will attempt to create a new and empty segment of the specified length. The segment created may be shorter than requested. channel[in] The channel for the newly created segment. length[in] The requested length of the segment. Definition at line 734 of file llbuffer.cpp. References LLBuffer::createSegment(), end, mBuffers, mSegments, and LLMemType::MTYPE_IO_BUFFER. The channel descriptor interface is how the buffer array clients can know where to read and write data. Use this interface to get the 'next' channel set for usage. This is a bit of a simple hack until it's utility indicates it should be extended. Returns a valid channel descriptor set for input and output. Definition at line 251 of file llbuffer.cpp. The data is copied from src into the buffer array. At least one new segment is created and put in the front of the array. This object will internally allocate new buffers if necessary. Definition at line 281 of file llbuffer.cpp. You should prefer iterating over segments is possible since this method requires you to allocate large buffers - precisely what this class is trying to prevent. This method will skip any segments which are not on the given channel, so this method would usually be used to read a channel and copy that to a log or a socket buffer or something. channel The channel to read. start The start address in the array for reading. You can specify NULL to start at the beginning. dest The destination of the data read. This must be at least len bytes long. len[in,out] in How many bytes to read. out How many bytes were read. Returns the address of the last read byte. Definition at line 509 of file llbuffer.cpp. References end, getSegment(), llmin(), mSegments, LLMemType::MTYPE_IO_BUFFER, and S32. channel The channel to seek in. start The start address in the array for the seek operation. You can specify NULL to start the seek at the beginning, or pass in npos to start at the end. delta How many bytes to seek through the array. Definition at line 571 of file llbuffer.cpp. References end, getSegment(), llabs(), llmin(), mSegments, LLMemType::MTYPE_IO_BUFFER, npos, NULL, and S32. After this method call, getLastSegmentAddress(*getSegment(address)) == address should be true. This call will only create a new segment if the statement above is false before the call. Since you usually call splitAfter() to change a segment property, use getSegment() to perform those operations. address The address which will become the last address of the segment it is in. Returns an iterator to the segment which contains address which is endSegment() on failure. Definition at line 313 of file llbuffer.cpp. References base, end, getSegment(), mSegments, LLMemType::MTYPE_IO_BUFFER, S32, and size. This method simply strips the contents out of the source buffery array - segments, buffers, etc, and appends them to this instance. After this operation, the source is empty and ready for reuse. Definition at line 717 of file llbuffer.cpp. References mBuffers, mNextBaseChannel, mSegments, and LLMemType::MTYPE_IO_BUFFER. Definition at line 589 of file llbuffer.h. Referenced by capacity(), copyIntoBuffers(), eraseSegment(), makeSegment(), takeContents(), and ~LLBufferArray(). Definition at line 588 of file llbuffer.h. Referenced by nextChannel(), and takeContents(). Definition at line 590 of file llbuffer.h. Referenced by append(), beginSegment(), constructSegmentAfter(), countAfter(), endSegment(), eraseSegment(), getSegment(), insertAfter(), makeSegment(), prepend(), readAfter(), seek(), splitAfter(), and takeContents().